Recent Recipient of Leaders in Total Joint Replacement: Generation Next Award for recognition as one of Top 40 Nationwide emerging orthopaedic surgeon leaders. Dr Fabi is a board certified, internationally renown, fellowship trained innovative pioneer and high volume joint replacement specialist. He trained at the prestigious Rush University, a world renowned joint replacement center where he trained with the best and brightest in the field. There he learned cutting edge techniques, treatments and how to treat complex joint disorders. 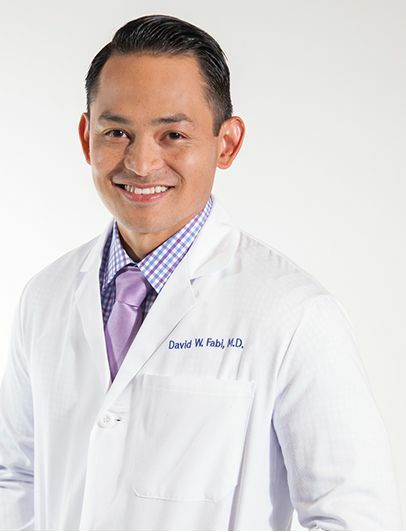 Dr. Fabi is also one of the earliest adopters of Robotic Joint Replacement and is one of the acknowledged experts in the field of Robotic Joint Replacement. Dr. Fabi also writes book chapters and publishes numerous articles in the subject of joint replacements. Being an expert in the field, he also give numerous lectures around the country. Providing patient care is a blessing and is not a privilege I take for granted. I pride myself on doing all I can to improve the quality of life of my patients in a compassionate educated and thorough manner. When the physician and patient communicate effectively and work together for a common goal, optimal treatment can be attained. In addition, I value connecting with my patients on a professional and above all, personal level. Fabi DW, Goldstein WM, Gordon AC. Dislocation of an S-ROM Total Hip Arthroplasty Secondary to Traumatic Femoral Stem Dissociation from the Metaphyseal Sleeve. Journal of Arthroplasty January 2009. Fabi DW, Mohan V, Goldstein WM, Dunn J, Murphy B. Unilateral Versus Bilateral Total Knee Arthroplasty: Risk Factors Increasing Morbidity. J Arthroplasty. 2011 Aug;26(5):668-73. Epub 2010 Sep 28. Fabi DW, Levine BR, Paprosky W, Sporer S, DellaValle CV, Klein G, Levine H, Hartzband M. Metal-on-Metal Total Hip Revisions: A Review o Causes, Clinical Outcomes and a High Incidence of Early Failure. (Accepted to Orthopedics 2012). Fabi DW, Levine BR. Book Chapter: “Porous Coatings in Metallic Implant Materials”. Handbook of Materials for Medical Devices 2nd Edition. Fabi DW, Levine BR, Rosenberg AG. Management of the Stiff Knee: Case Presentations- Revision Total Knee Arthroplasty. Techniques in Revision Hip and Knee Arthroplasty, edited by Dr. Giles R. Scuderi with Drs. AJ Tria, Michael Kang, and William Long. “Complication Rate twice as high for bilateral than unilateral TKA”. Orthopaedics Today. November 2010. Fabi DW, Levine BR, Paprosky W, Sporer S. Metal-on-Metal Hip Revisions: A review of Common Causes and a High Incidence of Early Failure. 2011 American Academy of Orthopedic Surgeons Meeting ePoster Presentation. Fabi DW, Nicole Majoras BA, Brett R Levine MD. Efficacy of Fibrin Sealant Evicel in Total Hip and Knee Arthroplasty: A Retrospective Case-Control Study. Fabi DW. Jung E. Levine BR. Porous tantalum cones in revision total knee arthroplasty. (To be submitted 2012). Fabi DW. Wile PB. Cadaveric analytic comparison of Conformis customized knees versus Biomet Vanguard knees. University of Illinois Department of Orthopedic Surgery and Biomechanical Engineering. Under: Dr. Mark Gonzalez and Dr. Farid Amirouche. Biomechanic Analysis Using a Finite Model of Initial Fixation of Trabecular Metal Acetabular Cups in Simulated Revision Hip Arthroplasty. Under: Dr. Margaret Lomax. Investigated gene sequences in bird cochleas in order to map the human cochlear genes for the Human Genome Project. Fabi DW, Levine BR, Deirmengian C. Digital Templating in Primary Total Hip and Knee Arthroplasty. 27th annual Rush University Forum for Research and Clinical Investigation. Chicago, IL. Fabi DW, Nicole Majoras BA, David Fabi MD, Pranay Patel MS, Brett R Levine MD. Use of a Novel Fibrin Sealant in Total Hip and Knee Arthroplasty. 27th Annual Rush University Forum for Research and Clinical Investigation. Chicago, IL. Fabi DW, Gonzalez MH, Amirouche F. Initial stability of porous press-fit tantalum acetabular components in acetabuli with and without rim defects: a cadaveric experiment, UIC Senior Thesis Day. Chicago, IL (June).